Buy the newest varnishes with the best sales and promotions. Find cheap offers for varnishes in our online store. 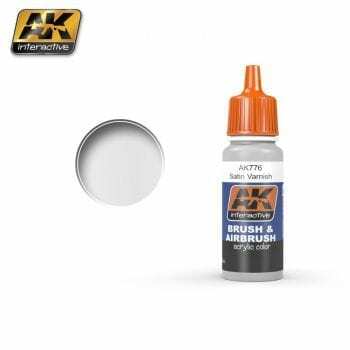 Acrylic Matte Varnish formulated for maximum airbrush performance. Water soluble, odorless, and non-toxic. Shake before each use. We recommend AK-712 Acrylic Thinner for thinning. Dries completely in 12 hours. Acrylic Satin Varnish formulated for maximum airbrush performance. Water soluble, odorless, and non-toxic. Shake before each use. We recommend AK-712 Acrylic Thinner for thinning. Dries completely in 12 hours. Two-component ultra-gloss lacquer. Mix the lacquer and hardener in 3/1 ratio. Contains a 60ml bottle of thinmer, 60ml lacquer and the hardenerand two syringes. Get the maximum brightness in your models. Instructions in the box.